The Swagtron Voyager is the one board that lives up to its name, with an uber hip design which reminds you of the 90’s skateboards. This ‘swag board’, is packed with ultra-cool features, incorporating the best quality electronics and motors which gives you tremendous power! The Swagtron takes you places in no time, owing to its maximum speed limit of a whopping 30 miles per hour! It also comes with safety features, meeting the UL 2272 norm standards. The best part of the Voyager is that it gives you an excellent hill grade, even at the maximum user weight (330 lbs., which makes the board the only one in the world, equipped for plus size riders), maintaining the speed and balance! Moreover, it has large wheels, which go over bumpy areas smoothly, the whole aura of it exactly like them old skateboards! You can also ride it manually when the battery dies out! Is Swagtorn Voyager Longboard Cost Effective? The Swagtron 42” Longboard has a rather retro look, with ninety’s looking graffiti printed on the grip tape of the deck. The grip tape gives unbeatable traction, covering the deck which is made out of eight plies, six of the layers being Canadian Maple and the other two, bamboo wood. This 8-ply wood, gives the much-needed support for even the heftiest of riders, and thus the Swagtron is equipped to hold up to 330lbs. (150 kg)! 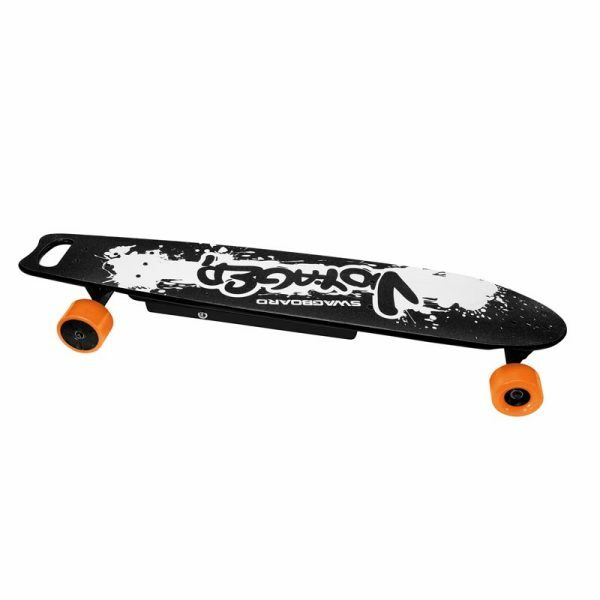 The Swagtron is a true long board, almost being 42 x 9 x 6” which clearly means that it can be ridden by really tall users too! The board weights around 19.3 lbs. as a whole, with the carrying handle built in at the back side of the board. It also has adjustable trucks for clearer calibration and board flexibility. Large 90 mm polyurethane orange wheels are classic of Swagtron, these wheels go over just about anything, and can also be used on skating arenas to show off your crazy moves! One thing you’d automatically notice about the wheels is that they are thicker in the front- this has been specifically engineered for the board, to support hefty riders in smooth controlled movement while going downhill. The 42” Voyager is certainly supplied with enough power to give the consumer a hill grade of 15 percent, with a maximum speed of 30 Mph! This is achieved even under the weight of 150 kg, due to the powerful dual 350W motors. Specifically made for speed, the Voyager is run by two, 36V LI-FE batteries, which are scientifically proven to be safer than standard Lithium Ion batteries. The batteries are 24 cells, and take around three hours to fully charge. The board comes with a wireless remote controller, which is quite intuitive and easy to use, hold and accelerate with. The remote shows battery specs, speed, current range, etc. The dual motors give the board full power of 700 watts, and once the batteries are fully recharged, the Swagtron Voyager gives you a range of up to 15.5 miles! With a safety certification (UL 2272 certified), you can be confident that the board is a hundred percent safe, even for teens! The battery pack and motors are protected with a patented, safe, shield encasing which keeps the rider and board away from harm. The remote control can be used to accelerate, brake and has a cruise control mode, where you can make the board go at a particular speed. You can also limit the speed as per your requirement. The remote also shows the battery life and range. Covered with grip tape from head to toe, the deck sports a concave look, which is known to maintain stability even while going uphill or on cracks! This 42” longboard comes with a full warranty of 1 year, just in case of discrepancies and defaults in manufacturing, which according to users, is rare. $400 is all it costs, for the Voyager, which is very reasonable for the power and flexibility it provides! The board gives a great range, is the only board to take 330lbs of weight while giving a speed of 30 miles per hour. The entire set up comes with the board, the remote, the remote’s charger, battery charger and the user guide. Wrapping it up, the board feels like just another classic longboard, with added power!